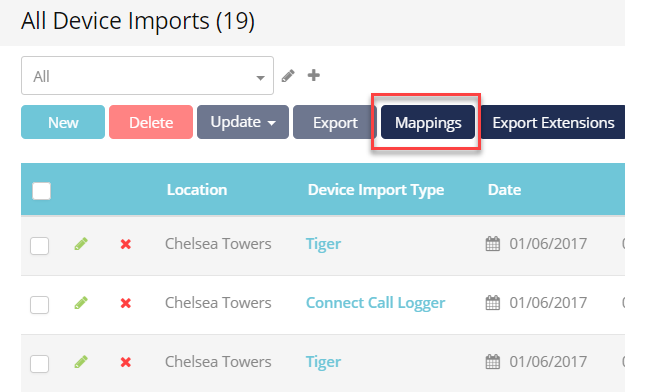 If you need to import charges from a specific application which is not included in the list of Device Imports supported by Operate, then you can map your own import, using the Mappings feature. You need to first map your import. Next, you need to add account codes in order to match the charges to existing Operate accounts. Get started by going to Charges > Device Imports, then clicking the Mappings button. Enter a Device Name - This is the device or otherwise the application where your data is coming from. Select a File Type - This can be a Flat file or an Excel File. Each time you import, your data will need to be added using the file type you select here. Select the file Extension - Just like the file type, this will determine what extension your file needs to have, each time you run an import. The available extensions are: CSV, XLS, TAB, CLG, VSM and TCD. 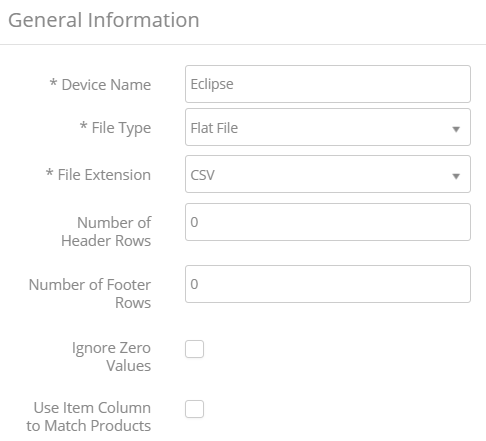 Set a Number of Header Rows as well as Footer Rows, to allow Operate to identify which rows should be ommitted from the import, in order to avoid mismatched records. To set this up, you need to look into the file export you get from your device/app and see how many header and footer rows there are. Check the box to Ignore Zero Values if you want to. In this case, zero values will not be imported. Select whether to Use Item Columns to Match Products. Usually, when a file is imported using the device import, all charges are assigned to a single product. If this option, is used, the import will use this item column in your import file to match against the product list you have in Operate. Save your import map when you are happy with your setup. 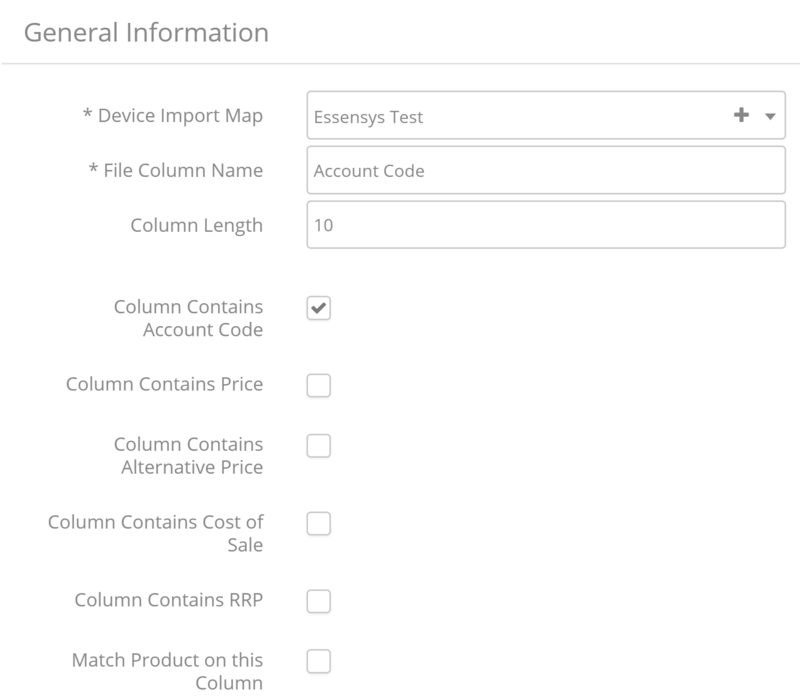 Select the Device Import Map - By default, this is the one you've just configured and are setting up columns for. Please leave it as is. Choose a File Column Name - This should be exactly the name given to the column within your import file. Add a Column length in number of characters. This fields is optional. Column Contains Account Code - This column will need to match the account codes set up within your Operate system (please see the section below for more information). Column Contains Price - This column will be matched to the Product Prive in Operate. Match Product on this Column - This column will be used to match charges against the product list you have in Operate instead of a single product (the one you select when you import charges). Save your column when ready, then repeat for all other columns contained within your file. Please note: If there are columns which don't have a correspondent on the Operate Product records, then you need to create custom fields in order to allow Operate to store them. You will also be able to view it. Simply click its title in the Import Maps list view to do so. When you view your map, you can scroll down to the bottom of the page to set up Account Codes. The Account Codes allow Operate to identify the Account to which the imported charges should be applied. In your imported file, each of the charged accounts need to have an Account Code column added to the export file. The same code needs to be added to the Account record within Operate. You can easily add them from within the Import Map page. This may need to be done every month if there are new customers who have not been charged before. Click New under the Account Codes section. Select the Account to which you want fo add the code. Select the Map you just created, from under the Device Import lookup. Once your map has been created and your codes associated to their respective accounts, you are ready to import your charges.